If you are not from Australia, chances are that you have not heard of the Clarence River, in New South Wales. You are really missing something, and we are out to change that. The Clarence River, at 400 km, is the second largest river on the east coast of Australia – and good news, no crocodiles! 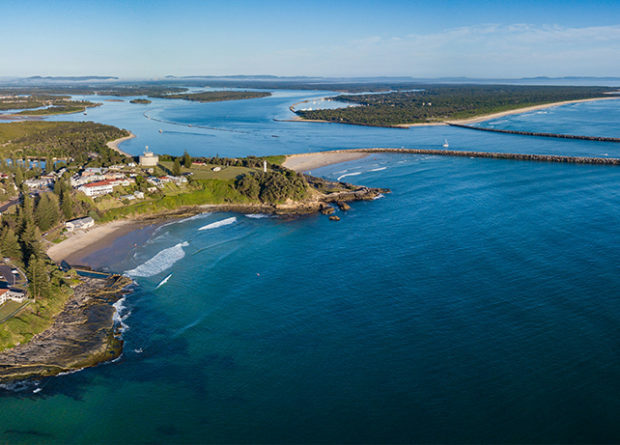 Located in the Northern Rivers region which reaches to the Queensland border, the Clarence River offers forested upper reaches, lush farmland along the lower reaches and ends at a coast filled with splendid beaches. That would be about 40 beaches in the Clarence Valley area. The subtropical climate means that we will enjoy in equal measure time in the boat and time exploring this beautiful but little-known region. Sounds like a perfect Australia rowing tour! 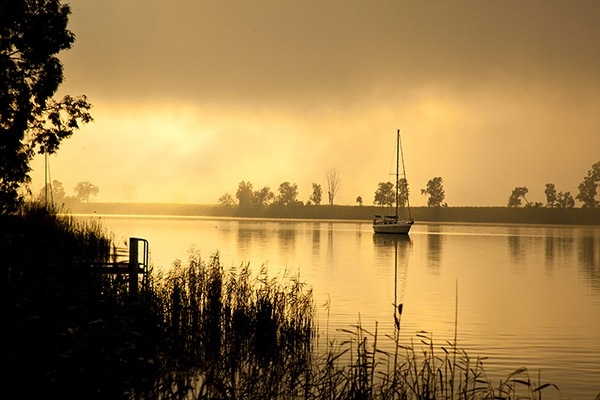 Sometimes wide and stately, at other times intimate when islands create narrower channels, the Clarence River is generous in its diversity of scenery and experiences. We begin our “rowing trail” just downstream of Australia’s longest canoe and white water trail. For about 100 km we will explore the changes in the landscape as we row to the sea. Minimal boat traffic will intrude on our enjoyment. Tidal influence and sea breezes reach up past Grafton, but currents are gentle and calm water is the norm, especially in the cooler mornings. Three clubs dot the Clarence, and friendly local rowers will welcome us and show us their stretch of the river. Greens and blues seem to be signature colours. Vast swatches of green appear on maps, representing all the national parks and protected areas. Blue is for the ocean and rivers. Green forests cloak gentle hills and thick green sugar cane fills fields. The water, whether fresh or salt, presents every hue of blue, and some green too. We will make a point of visiting the Angourie Blue and Green Pools. Of course there are lots of other colours too, such as beautiful pink, purple and gold of sunrises and sunsets. Watch for flashes of colour from the abundant birdlife such as brolgas, kingfishers and parrots. One could say that there is local colour in the people, a mixture of farmers and foresters, surfers and people who have left the big cities to embrace a less hurried pace. Want more Australia? Immediately following this trip will be our Sydney Weekend – details to come soon. We are planning additional Australian rowing adventures in November 2019 too! SPECIAL OFFERS! Yes, we have two – sorry, can’t be combined. If you are an Australian rower and register by 01 February 2019, we will be pleased to offer you C$200 off the tour price! If you are accepted to the FISA World Rowing Tour in NZ, we will gladly offer you C$100 discount on the tour price, plus a donation in your name to the Norbert Fund of $50, supporting rowing development in Samoa. Note that this is the first time this trip will be run, so it is somewhat experimental in nature. Plans could change. In particular, river and weather conditions will be an important consideration – safety is a priority. Thus, on some days, the actual program may vary from this description. Arrival in the Clarence River Valley. From designated pick-up points, we will transfer the group to our first accommodation, a lovely B&B right on the banks of the river. With 16 acres of lush property and resident population of wallabies, a koala and echidnas, we know that we are in Australia. We settle in for two nights, beginning with a welcome dinner and briefing about the week’s adventure. In the morning we trailer the boats upriver to Copmanhurst, which” has a pub and a general store – the trademarks of all good country villages”. But our draw is to the water and the start of the rowing. Sandstone cliffs sometimes line the winding river, while in other places low pastures gently end in sandbars. A leisurely 17 km takes us to Rogans Bridge where we will leave the boats. No problem to know when we are there – it will be the first bridge that we see today. In the afternoon after lunch, we will drive further up the Clarence River to the spectacular scenery of the Gorge, one of the loveliest and unique features of the river. Surrounding it is an active cattle station, and our tour guide is member of the family that has farmed here for over 100 years. It is a short drive back to Rogans Bridge and the boats. The row today is 25 km. We will scull past stands of red cedar and bay fig trees. Red cedar was important to the early development of the area. Much used in colonial furniture and house building, harvested trees were transported down the river by boat. Nowadays they are a protected species and lovely to see growing along the banks. Our destination is Grafton, the oldest city on the north coast. This means tree-lined streets, historic buildings and grand pubs. We could spend the afternoon exploring the town, especially charming Victoria Street with buildings from the 1800’s. Call it a history walkabout. There are also some very modern coffee shops, cafés, art galleries and shops to browse through. An easy bike ride, row or canoe takes us to Lanbruk Gunyah on Carr’s Creek, with its eclectic museum celebrating the farm’s heritage. Especially famous are the organic olives – we will pick up some supplies for our picnic tomorrow. Our accommodation is once again right on the river bank, and we will enjoy an excellent dinner in town. 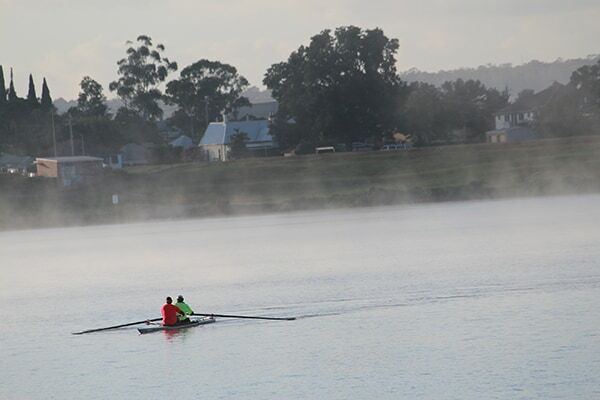 From Grafton Rowing Club, a pleasant 23 km takes us to Brushgrove. After a couple of islands, the river widens in this section, a languid stretch where trees line the bank and dragon flies dance on the water. The riverside village of Ulmarra makes a perfect break – it has an excellent reputation for its cakes and tea or coffee, among other features, especially at the beautifully preserved Ulmarra Hotel with its lacy ironwork balconies. The Ulmarra Ferry crosses the river here. It is a short drive from where we leave the boats in Brushgrove to Maclean. We will settle in for two nights at the valley’s newest accommodation, adjacent to the lawn bowling green. We might try a round of barefoot bowls. Maclean is proud of its Scottish heritage with 200 decorated tartan power poles, a Scottish Cairn and Highland Gathering festival each Easter. Can you hear the bagpipes? Back to Brushgrove in the morning. Brushgrove is where the river splits into two main steams. Our destination is the Maclean Rowing Club, 20 km away. We will take the south arm, which is narrower and more intimate as it winds through pretty farming land with sugar cane, cattle and plantains of macadamias and pecans. As we approach Maclean we will follow the local club regatta course and also the training grounds for past Australian Olympic rowers. We will keep our eyes open for birds and wildlife, such as black swans, pelicans, grey kangaroos or perhaps the Eastern Water Dragon. In the afternoon we will head to Maclean Lookout, also called the Pinnacle, which offers a wonderful 360 degree view of our river and its island and surrounding bushland and fields and then to the coast where we will be heading soon. Dinner tonight is on your own. For the next two days, our morning rows get shorter. This is because the closer we get to the ocean, the earlier the sea breezes pick up. No worries, mate! 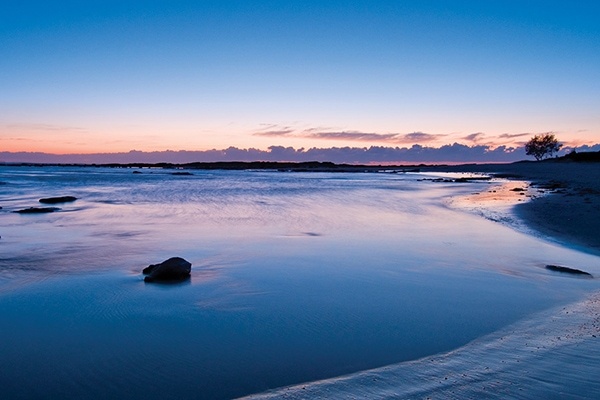 This gives us more time to explore the stunning coastline. First a lovely row of 15 km to Woombah. As the Clarence River approaches the sea, it divides into many arms wrapping around lovely islands: Warregah, Harwood, Chatsworth and Goodwood to name the bigger ones. A small commercial fishing fleet operates from this part of the river – a welcome sight, bringing fresh harvests of fish, crabs, prawns and lobster. 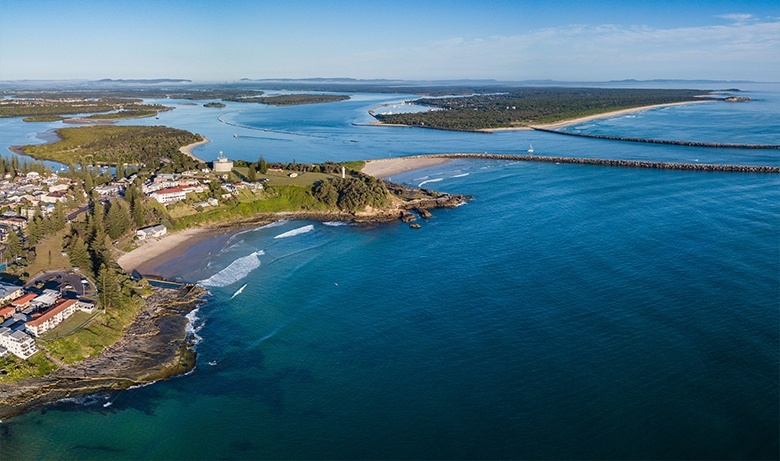 We will stop for lunch in Yamba, a fishing and beach town with fine food for hungry rowers. 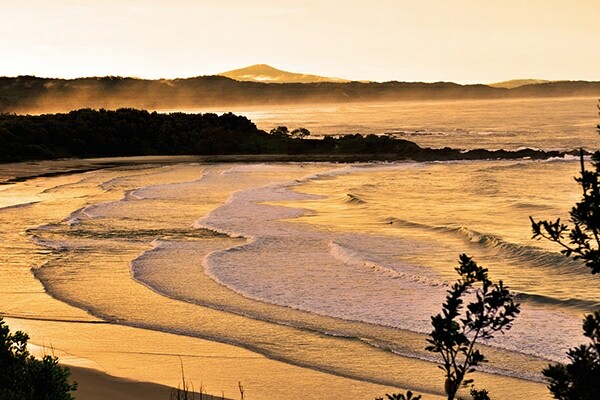 Angourie, where we will enjoy our last two nights, is most famous as one of the first Australian surf reserves. It retains “a special place in the big beating heart of Australian surfing”. We will stroll to Angourie Point to watch the surfers, then swim in the much gentler waters of Spooky Beach or the Angourie Blue & Green Pools. Or perhaps the spa at the resort beckons? In the early morning we return to Woombah for our final paddle of 10 km to Iluka, completing our journey down the Clarence River to the sea. Nearby is the Iluka Nature Reserve, where we will stroll the delightful Iluka Rainforest Walking Track, through NSW’s largest remaining seashore rainforest, part of the Gondwana Rainforests of Australia World Heritage Area. The path weaves past strangler figs and vines to a spectacular headland at Iluka Bluff lookout in Bundjalung National park, with its panoramic views. It is the perfect place for our picnic. We will pop back to Yamba via the passenger ferry and then back down to Angourie. Maybe we will have time to walk a little on the Yuraygir Coastal Walk as it leads into Yuraygir National Park. Our farewell dinner caps off a wonderful week. 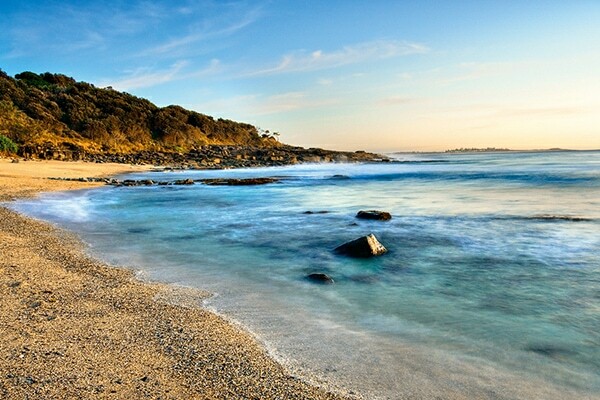 Take time for a final stroll along the beach after breakfast before heading off for your next Australian adventure. You will take with you fond memories of the delightful Clarence Valley. Tell your friends, this place deserves to be better known..